Did I try and say American Sniper was emotional? I take it back. After watching this movie, American Sniper is a distant memory. The Imitation Game was a depressing commentary on human behavior? Pshhhh. You thought The Grand Budapest Hotel was stylistically leaps and bounds ahead of the other nominees? Only because it didn't have to go head to head with The Tale of Princess Kaguya. I could go on, but I think it's clear how I feel. 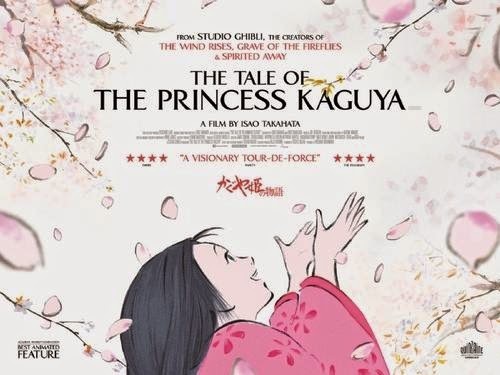 The Tale of Princess Kaguya is easily the best movie of the year. Easily. It's visually stunning beyond your average animated feature. The classic Japanese painting style evoke memories of a time before all animated movies looked so similar that no one can tell which studio made what. The animation also varies throughout the movie, moving seamlessly between crisper, cleaner images and rougher, more sketchy drawings that help draw parallels to a character's state of mind. This, combined with the score, allows the movie to more completely convey unspoken changes and feelings than regular movies. It is also a deceptively simple tale. It is quiet and slow and relies on it's building of the story and its characters to carry the story from a fairy tale to a complex narrative on the human experience. If you look beyond the surface of it, it will make you question everything from your relationship with your parents, the role of money in the world, and what it means to be happy in life. One might construe the story as too slow and possibly a little boring in the beginning, but as with all thought-provoking films, you need to watch it all the way through before passing judgment. I almost hate to point out the minor flaws because I so thoroughly loved this movie. I also hate how pretentious this will sound, but the Japanese animated movies are just not the same in English. 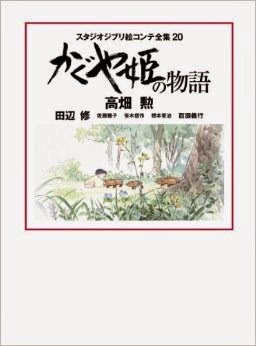 I grew up watching My Neighbor Totoro and other Studio Ghibli films in their original Japanese with English subtitles, so this lost a touch of the magic the other possess with their full foreign experience. The Japanese language is so beautiful and it would help mask some of the dialogue that sounds a bit stilted when spoken in English. Also, we wouldn't be subjected to the voices of James Caan and Chloe Grace Moretz for two hours. But again, all these things can be forgiven when presented in a movie as complete and beautiful as this. Final word: With the risk of sounding as though I have written an acceptance speech for a movie I did not create, I am grateful to the Academy for introducing me to this movie with its nomination. P.S. If you still feel like you can't take my word for it, this movie has a 100% rating on Rotten Tomatoes. 100%!